Deb's Cup of Tea: Maybe Zombies? 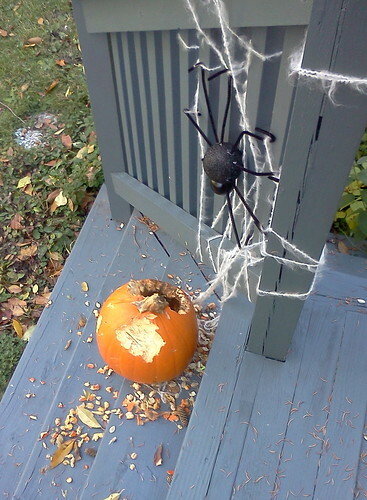 It was probably silly of me to think the squirrels would leave the pumpkins alone. It's one thing for them to be in a pile with hundreds of other pumpkins and lots of people. It's quite another thing for them to be alone on my front steps. Hence, I shouldn't have been that surprised when they chewed into one and then the other. Over the weekend, I heard a noise and when I looked outside, there was one of the fattest red squirrels I have ever seen with his head in the north side pumpkin. He filled the entire hole they had chewed. They love pumpkin seeds and I don't really blame them but the squirrel doing the eating looked like he needed Weight Watchers. Opportunistic buggers. I posted this photo to Facebook and several people suggested it looked like the spider had dug the hole. 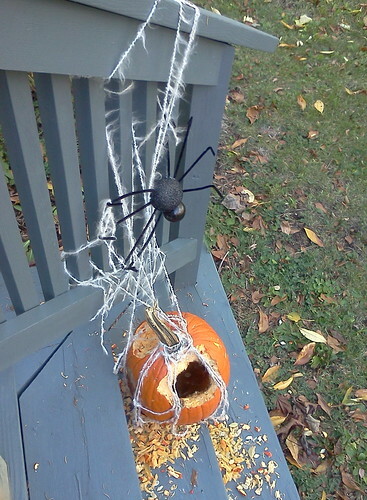 "You know, zombie spiders bursting out of pumpkins..." or as Melody called it, "pumpkin zombie apocalypse". 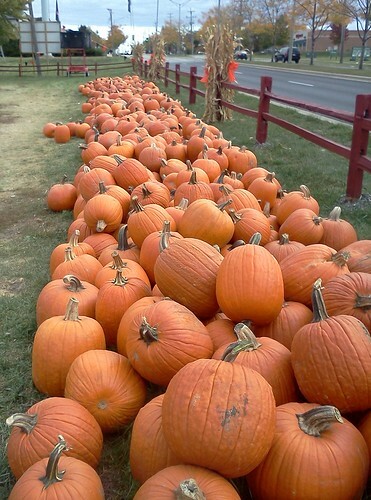 At first, I was going to get new pumpkins, but, the more I think about it, the more I could use these as they are. I have to sweep the detritus off the steps which probably means volunteer pumpkins in the front come spring. Then, I could spray paint 4 more of the balls black, cut short legs and they could be hatchlings coming out of the pumpkins. We got 2 inches of rain over the weekend and other than the webbing looking a bit beaten down, the spiders survived the deluge just fine. I was a touch upset by the chewing but, now that I step back to think about this, it could be really funny. So, the next step, spray paint more balls and make more spiders! The pumpkin chili sounds really good. I'm going to have to try that.